If you’re a power blogger, or someone who blogs regularly, across multiple blogs, with detailed, in-depth posts, a desktop blog editor can make your life infinitely easier. At least when it comes to the blogging aspect of it. There are a lot of blog editors out there. Some are browser-based, some are standalone. 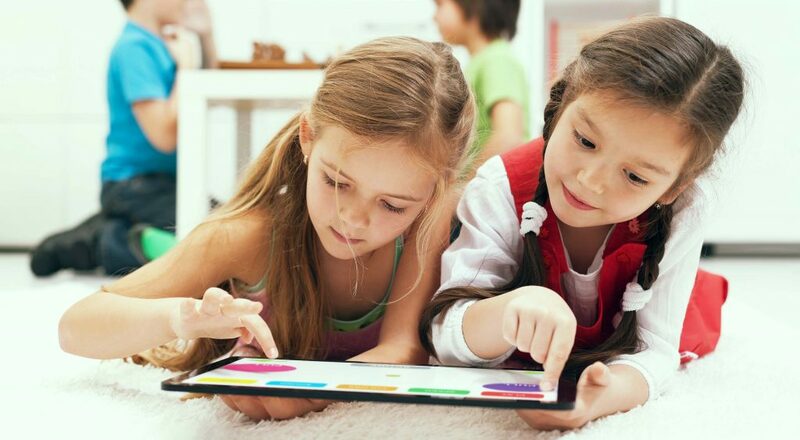 Some work across different platforms while others are only for Windows or Mac OSX. Some are paid while others are free. 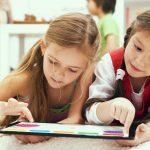 The main thing they all have in common, though, is their ability to streamline your blogging process. Below are more than 20 great desktop blog editors. There are options for every budget and every platform. Some even let you blog without blogging software. Bleezer is a free blogging client that features WYSIWYG editing, category support, spell check, image uploads, and an offline mode. It supports any blogging client and multiple tagging services. 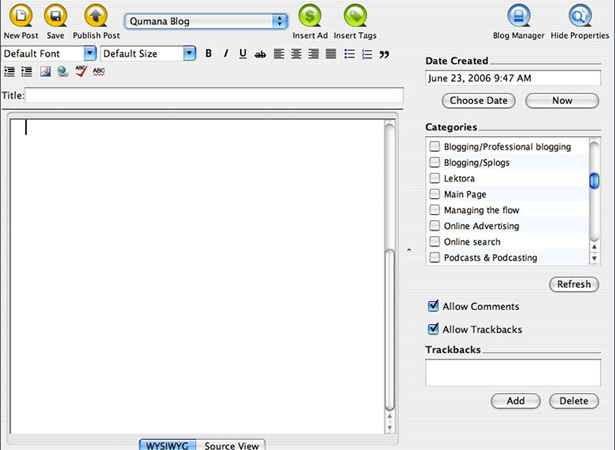 BlogDesk is a free blog editor for MovableType, WordPress, Drupal, Serendipity and ExpressionEngine. 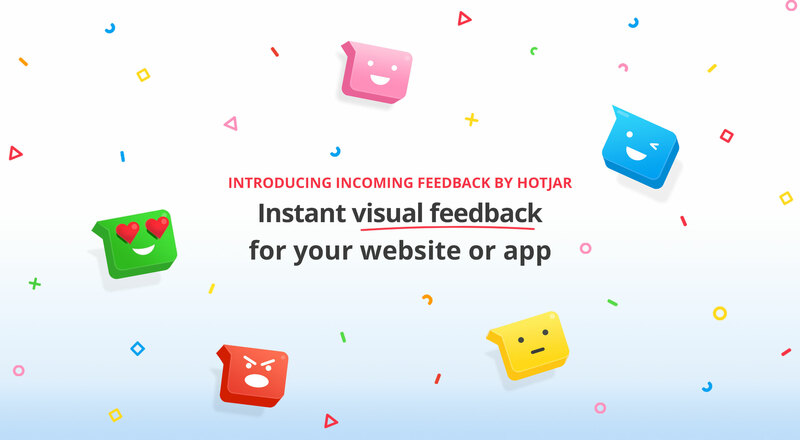 Its features include a WYSIWYG editor, image editing and insertion, the ability to edit already-published posts, a tags generator, and spell check. There’s a downloadable PDF guide to using BlogDesk, too. 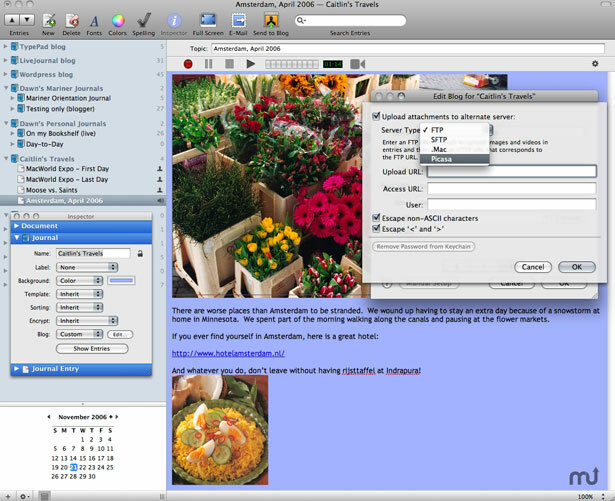 BlogJet’s major features include a WYSIWYG editor, spell checker, word counter, and native support for embedding YouTube and Flickr images. It supports all of the major blogging platforms: WordPress, Movable Type, TypePad, Blogger, Drupal, Squarespace, BlogHarbor, MSN Live Spaces and more. Posts are cached and are instantly searchable so you can access older posts, even without an Internet connection. 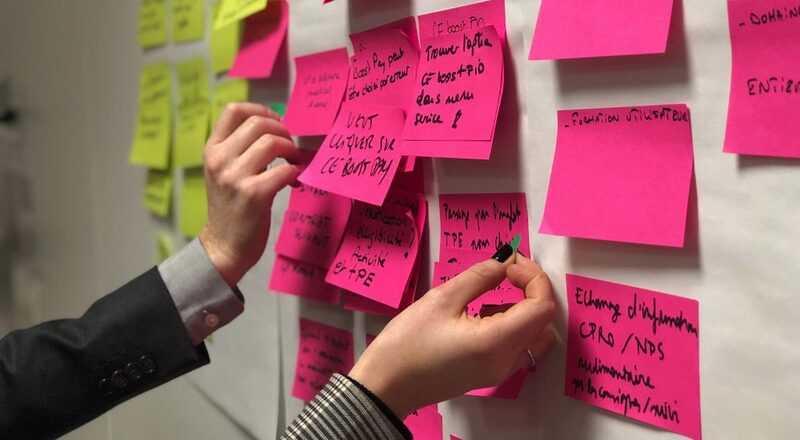 Other useful tools include an auto replace function, group posting on multiple blogs, and integration with browsers and feed readers to make blogging about things you’ve found online quicker and easier. 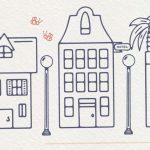 BlogJet’s biggest downside is its pricetag: $39.95 for a personal single-user license and $79.95 for a single user business license (an unlimited business license is $399.95). 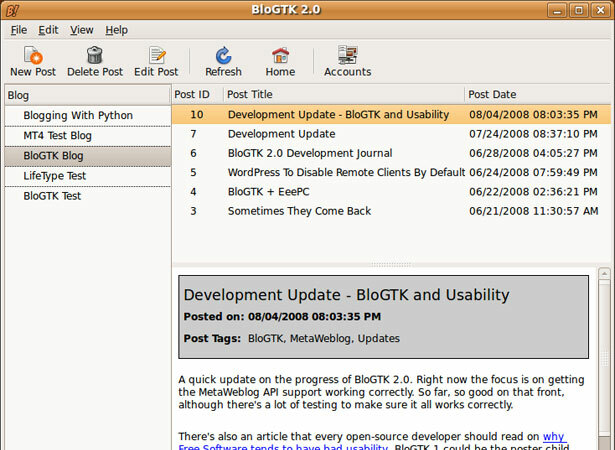 BloGTK is an open-source blog editor (released under the BSD license) that works in GNOME, allowing you to post without opening a separate browser window. It works with Blogger, WordPress, MovableType and other popular Python-based blogging platforms. Version 1.1 is currently available and work is progressing on Version 2.0. 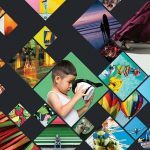 Windows Live Writer offers a range of features including support for inserting multiple photos, cropping and tilting photos, server-side tagging, Twitter, Digg and Flickr plug-ins, instant preview, word count, smart quotes, and spell check. It also supports inserting a Windows Live photo album within your blog posts. 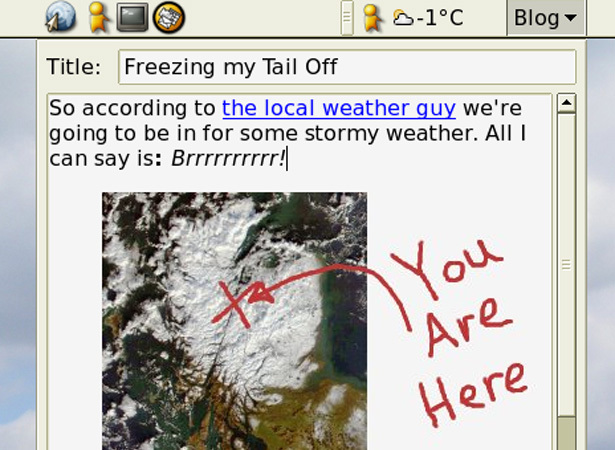 Live Writer is free and works with Windows Live, Blogger, WordPress, LiveJournal and TypePad, among others. MacJournal is journaling software for the Mac that supports blogging to the more popular blogging platforms as well as to .mac accounts. It also lets you record podcasts or video (with iSight) to attach to any blog entry. Entries can be assigned ratings, priority, and status, and then be sorted based on those tags. 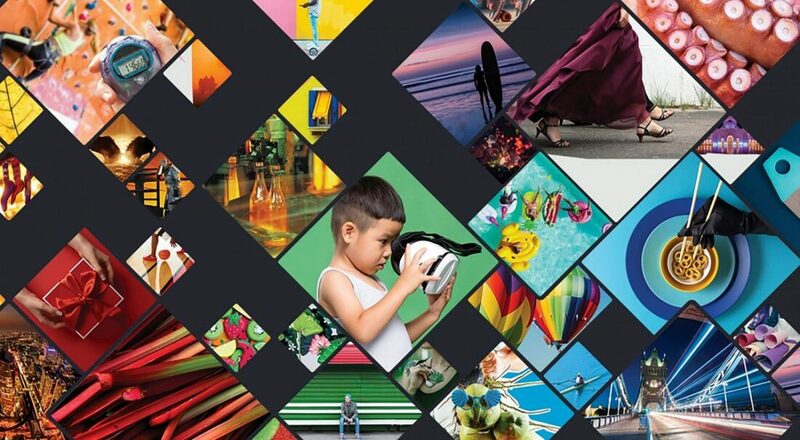 It also includes Picasa integration and lets you resize images within any entry. The cost for a single license is $34.95. Blogo is compatible with TypePad, Blogger, WordPress, Twitter, Movable Type, Drupal, and more. Blogo’s features include support for multiple accounts; the ability to insert, drag, and crop images, as well as insert video and widgets; microblogging support through both Ping.fm and Twitter; and an offline mode. Blogo is $25 but there is a 21-day free trial available. MyBlogEdit’s features includes offline editing, easy image integration and editing, a preview mode, customizable CSS, syntax-coloring for HTML editing, and more. It’s compatible with WordPress, Movable Type, TypePad, Expression Engine, and more. MyBlogEdit is €10. 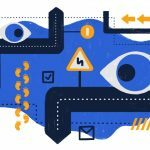 For WordPress power-users, there’s MyWeblog, which is similar to MyBlogEdit but includes support for other WP features, including page editing. MyWeblog is €19. 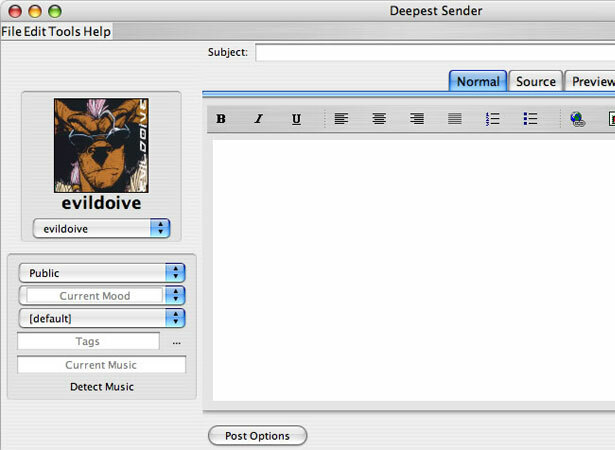 Deepest Sender is a free blog editor extension for Firefox, SeaMonkey and XULRunner. 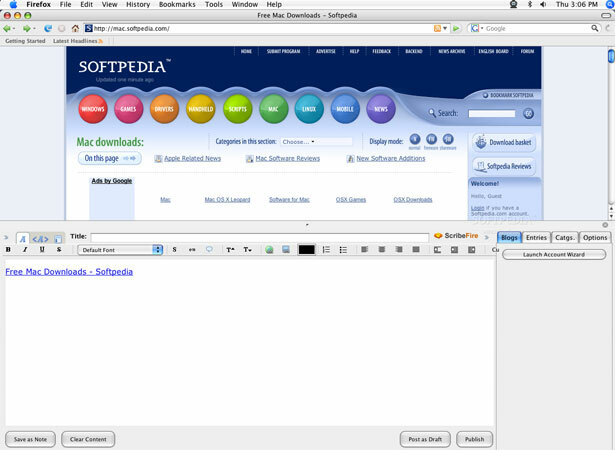 Its features include a WYSIWYG editor, support for multiple accounts, spell check, and an offline mode. It also has crash recovery so if your browser crashes while you’re midway through an entry, you won’t lose everything. Deepest Sender can be loaded into the sidebar of Mozilla or Firefox, allowing you to post from there. It supports WordPress, LiveJournal and Blogger accounts. 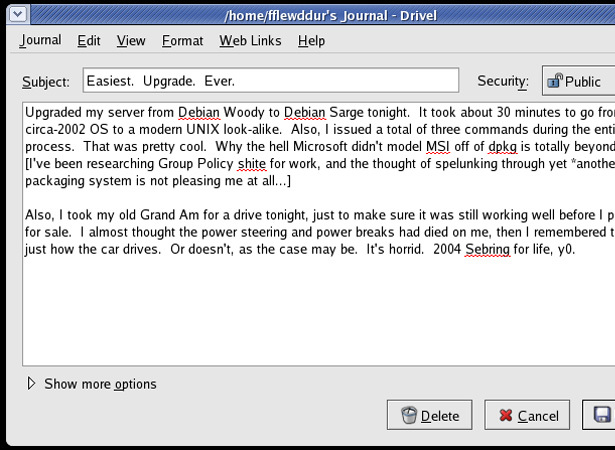 Drivel is a free GNOME client for blog editing. It supports LiveJournal, Blogger, Advogato, MovableType, and Atom-based platforms (like WordPress and Drupal). It has an offline editing mode, automatic recovery if the program crashes, spell check, HTML syntax highlighting, and system extensions (including MovableType’s categories and LiveJournal’s security groups). One of its nicest features is the inclusion of both simple and advanced post editing modes. 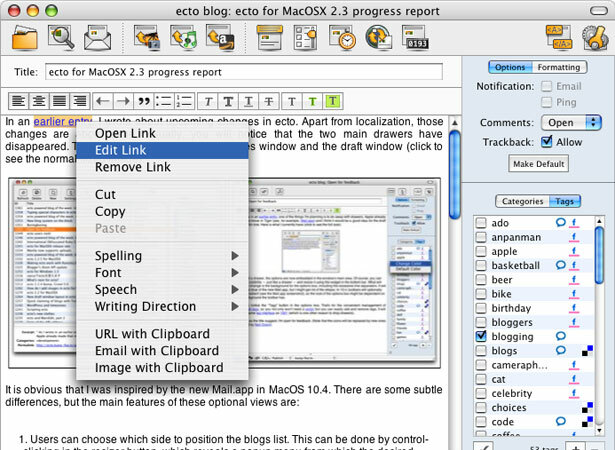 Ecto’s main features include a WYSIWYG editor and an HTML editor, local control of recently published posts and saved drafts, advanced image features (including converting and scaling), and support for multiple blogs. It integrates with common RSS readers to make reposting things you’ve read easier. 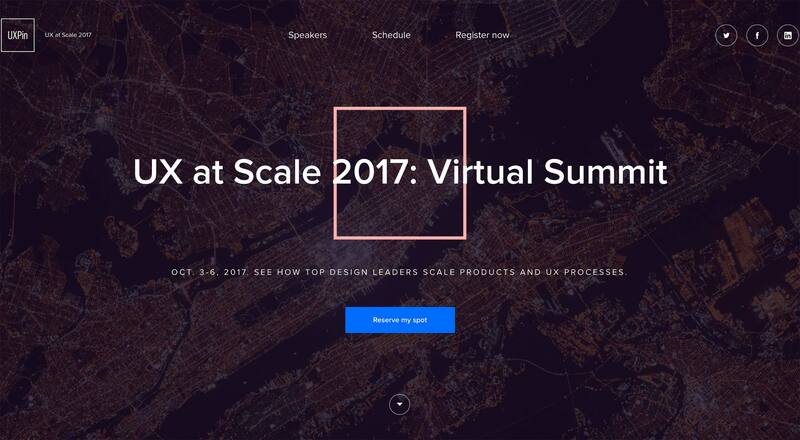 It uses Safari’s WebKit to provide full-featured previews of entries, too. Ecto works with Blogger, Drupal, Movable Type, SquareSpace, WordPress, TypePad and more. While Ecto isn’t free, its $19.95 price tag is by no means high. Flock is a free “social web browser.” It not only lets you post to your blog, but also to other social media accounts you may have. 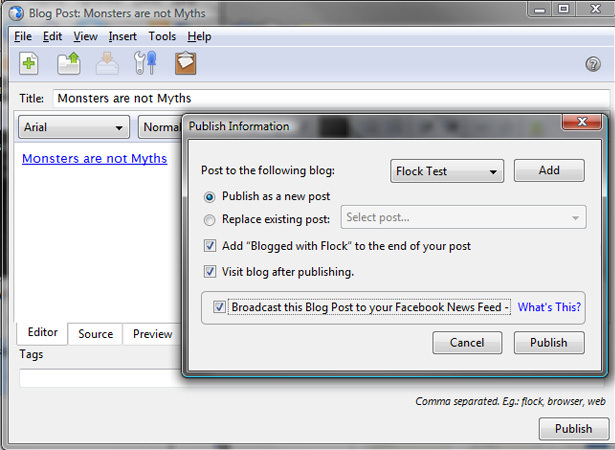 Currently, Flock supports Blogger, WordPress, LiveJournal, Blogsome, and TypePad, along with other social media sites. The blog editor itself is pretty standard, with a WYSIWYG editor, support for adding images and video, and basic text formatting options. Support for multiple blogs is also included. Gnome Blog is another free GNOME-based blog editor. It includes a WYSIWYG editor, a clean interface, spell check, drag-and-drop image insertion into posts, and the option to operate as a standalone application or an applet. 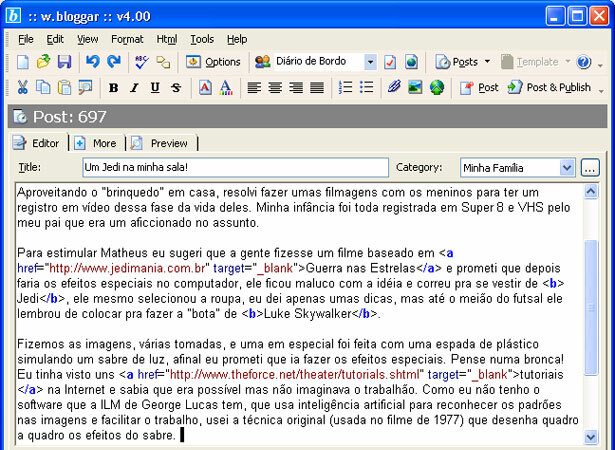 Supported platforms include Blogger, MovableType, WordPress, LiveJournal, Pyblosxom, Advogato and any other blog using the Blogger API or MetaWeblog. 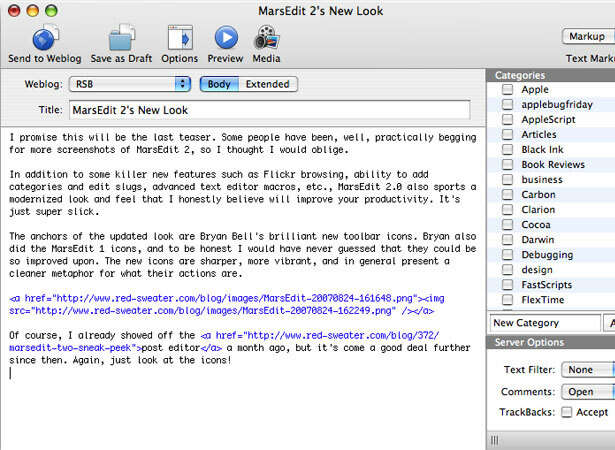 MarsEdit’s features include an intuitive interface that works a lot like email. 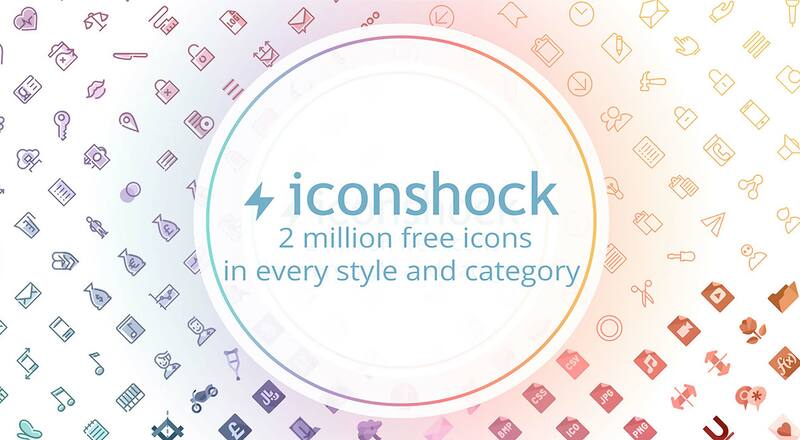 It has the ability to include images from your Flickr library, image and file uploads, offline editing mode, and AppleScript support for adding new features. It supports WordPress, MovableType, TypePad, Blogger, Tumblr, Drupal, LiveJournal, and more. MarsEdit is $29.95 but there is a 30-day free trial available. Newz Crawler integrates news feeds with a blog editor. It’s a great solution for bloggers who regularly re-post things from other blogs. Its features include a WYSIWYG editor, news channel organization, subscription synchronization, and the ability to download podcasts. 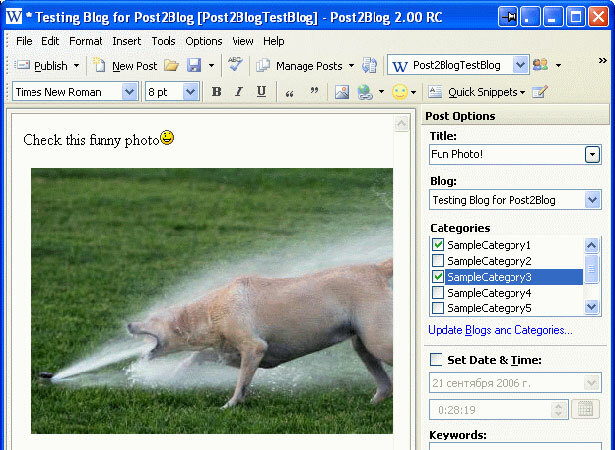 The blog editor functions seem to be pretty standard and NewzCrawler supports Metaweblogger, Blogger, MovableType, and LiveJournal API platforms. A single NewzCrawler license is $24.95. 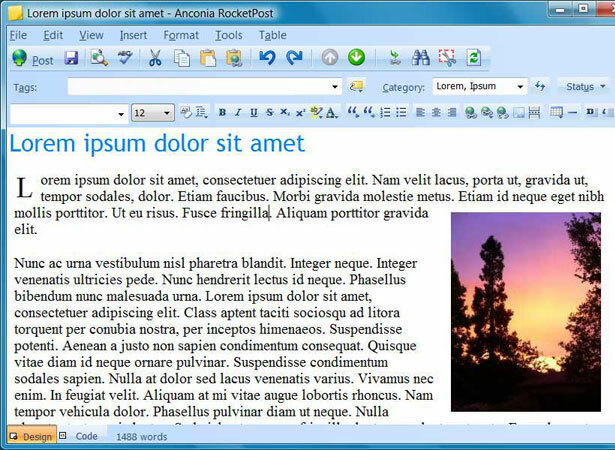 Post2Blog is a free blog editor that includes a WYSIWYG editor, an MS Word toolbar for posting directly from Word, plugins for posting text or images from Firefox or Internet Explorer, tag support, an “Insert Amazon Link” feature, and automatic image uploads. 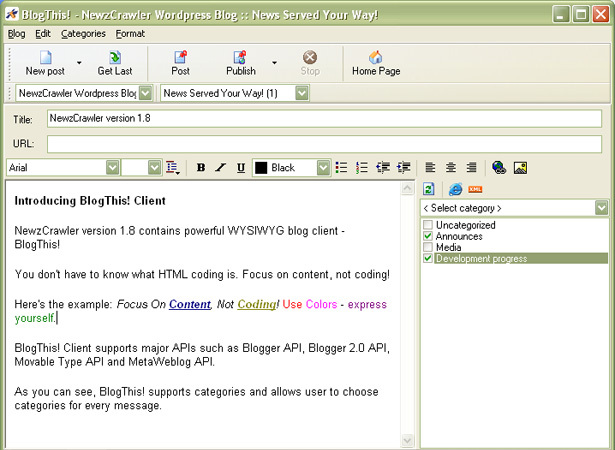 Supported platforms include Blogger, WordPress, TypePad, and MovableType. 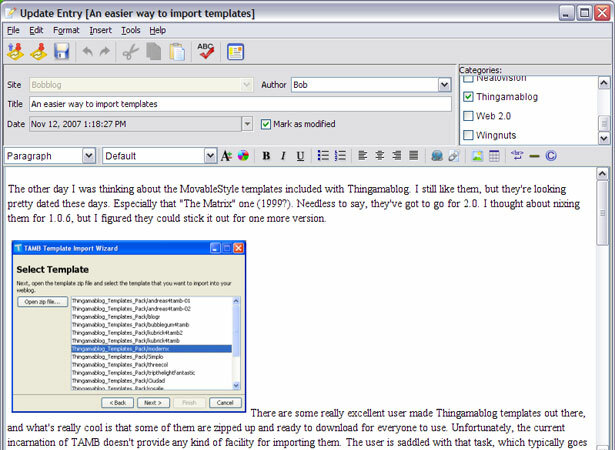 QTM is an open source blog editor based on the Qt graphical user interface toolkit. It works with most major blogging platforms, including WordPress, MovableType, Drupal and Textpattern. It does not work with Blogger, however. 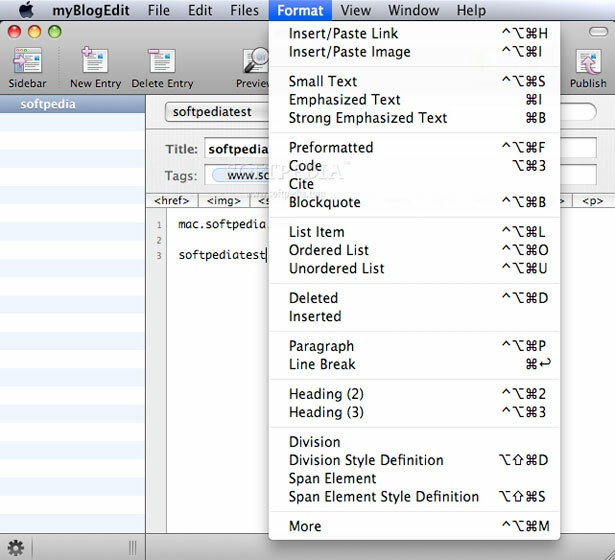 It includes all the basics: a WYSIWYG editor, support for categories and tags, and support for multiple blogs. 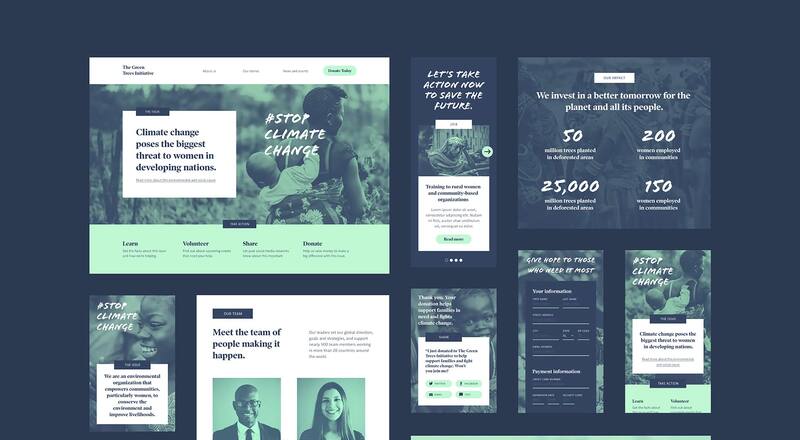 It also supports the creation of “Quickpost” templates, a huge bonus for those who post similar posts on a regular basis. Qumana’s features include a WYSIWYG editor, support for inserting keyword ads, Technorati tagging, offline editing, image uploads, and spell check. It also supports multiple blogs (including cross-posting). Supported blog platforms include Blogger, DiaryLand, Drupal, LiveJournal, WordPress, SquareSpace, TypePad, MovableType, MSN Spaces, and more. It supports Blogger, WordPress, MovableType, TypePad, BlogHarbor, MSN Space, SquareSpace, Drupal and more. 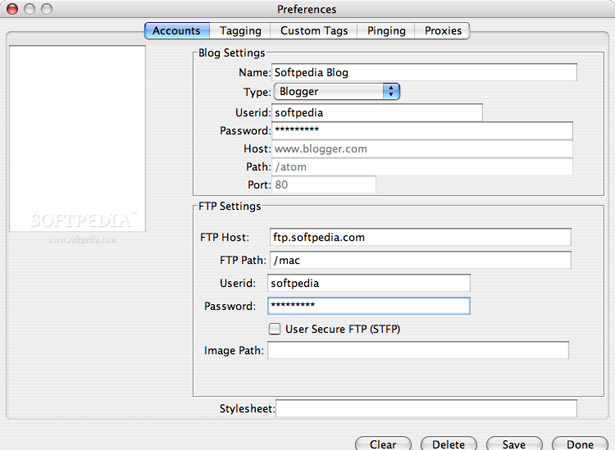 It also includes a standalone blogging option that doesn’t require a server install and works with regular FTP access. There are three licenses available: a free license for posting to Blogger or Live Spaces, a $29 singe-blog license, and a $49 multi-blog license. ScribeFire is a free blog editor extension for Firefox. 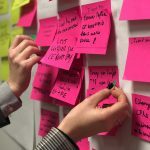 Features are pretty standard, including support for saving a post as a draft, a WYSIWYG editor, and the ability to set your posts’ timestamps. Major blogging platforms are supported, including WordPress, LiveJournal, Tumblr, Xanga, Textpattern, Blogger, Drupal, and MovableType. 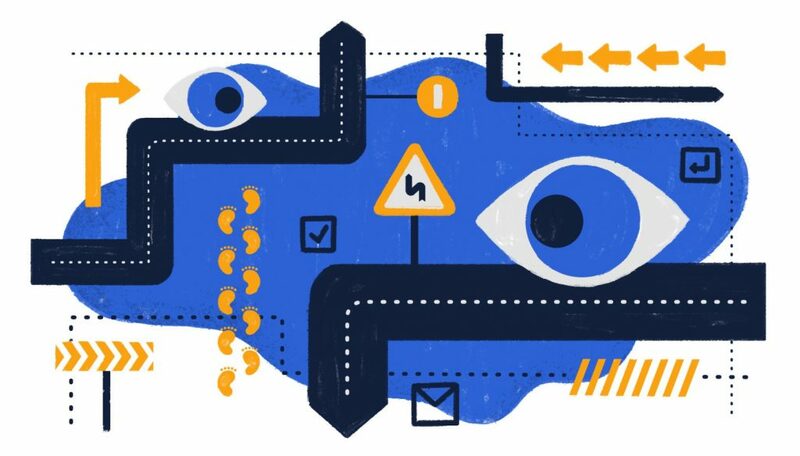 If you’re already a Firefox user, ScribeFire can really simplify your posting. Thingamablog is a bit different than the other options listed here. It’s a free blog editor that doesn’t require a third-party blogging host, a cgi/php enabled web host, or a MySQL database. You just need FTP, SFTP or network access to a web server. 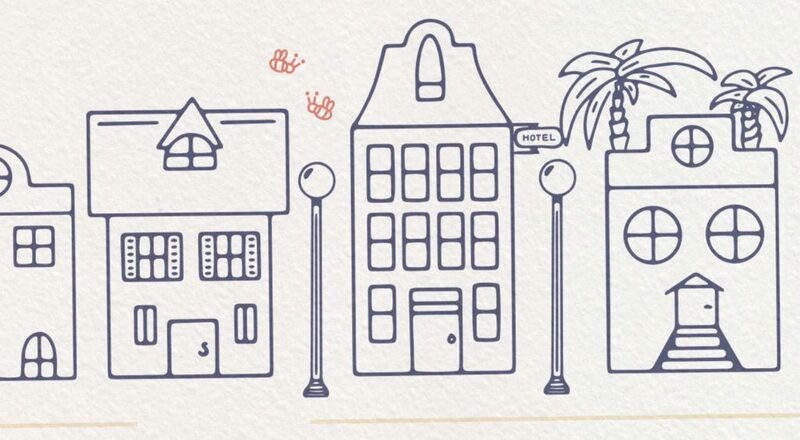 Basically, Thingamablog is a blogging platform in and on itself. It lets you maintain multiple blogs, manage thousands of entries, publish remotely via email, customize templates to create a unique layout for your blog, and syndicate your blog via RSS or Atom. It also integrates a news reader, offers an offline editing mode, supports ping services, and lets you dynamically update your blog’s content. It’s definitely a unique offering in the world of blog editors. 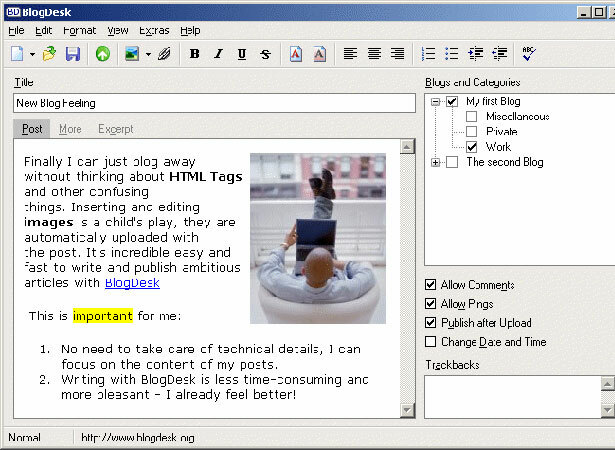 w.bloggar’s features include support for multiple blogs, an HTML tags menu, text formatting, post previews, and the option to save posts locally for further editing. Supported platforms include Blogger, MovableType, Blogalia, Squarespace, Upsaid, TypePad, MSN Spaces, Blog-City, DearDiary.net, Drupal, WordPress, PostNuke, LiveJournal, and more. 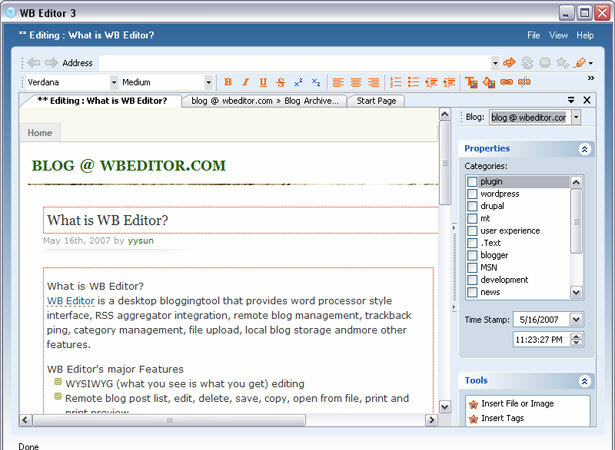 WB Editor features offline editing support, a WYSIWYG editor, remote post management, category and theme management, plugin support, image uploads, and support for all of the major blogging platforms, including WordPress, MovableType, MSN Spaces, Drupal, Blogger, and more. WB Editor is priced at $29.99 for a single user license. 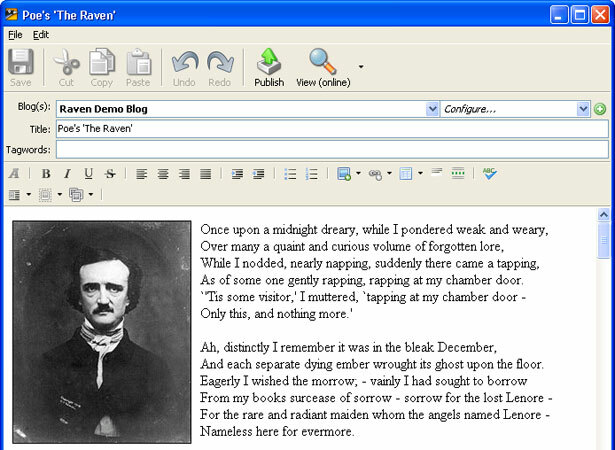 Zoundry Raven is an open-source blog editor that supports MovableType, TypePad, Blogger, Windows Live Spaces, WordPress and Blogger, among others. Its features include a tabbed WYSIWYG editor, multiple blog management, WP page and tag support, and management of multiple media storage services (including Picasa, and Image Shack).